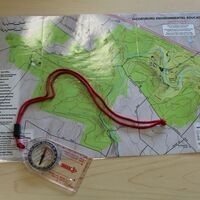 Orienteering is a fun, family-friendly sport that involves navigating a course using a map and compass. It can be competitive, in timed events, or just a way for your pack or troop to get out and enjoy the woods while practicing useful map-reading skills. During this hands-on experience you’ll learn how to read a topographic map, how to use a compass, and how to put all that knowledge together. All the equipment you will need is provided. Please bring water and wear comfortable shoes, there will be some hiking. Registration is required.